A 60-year-old man, a victim of schizophrenia, was found to have a nodule at left upper lobe of the lung (LUL) by chest X-rays during medical checkup. The high-resolution computed tomography (CT) scans showed that a 1 cm solitary nodule at LUL. Two years later, the lesion enlarged to 4.5 cm in size. He underwent single-port video-assisted thoracoscopic trisegmentectomy. Grossly, the lesion was a well-demarcated unencapsulated tan soft mass with massive necrosis. Microscopically, the tumor consisted of complex glandular structures with columnar cells having clear cytoplasm or supranuclear or subnuclear cytoplasmic clearing and central comedo-like necrosis [Figure 1]. Transition to conventional adenocarcinoma was noted [Figure 2]. Approximately 70% of tumor showed fetal morphology. The neoplastic cells expressed TTF-1 while the immunohistochemical stains for chromogranin-A, synaptophysin, CD56, α-fetoprotein, and glypican-3 were negative. The β-catenin was only expressed in tumor cell membrane without nuclear/cytoplasmic expression [Figure 3] consistent with high-grade fetal adenocarcinoma. The tumor was staged at pT2N0cM0. The patient recovered well postoperatively and is now under follow-ups. 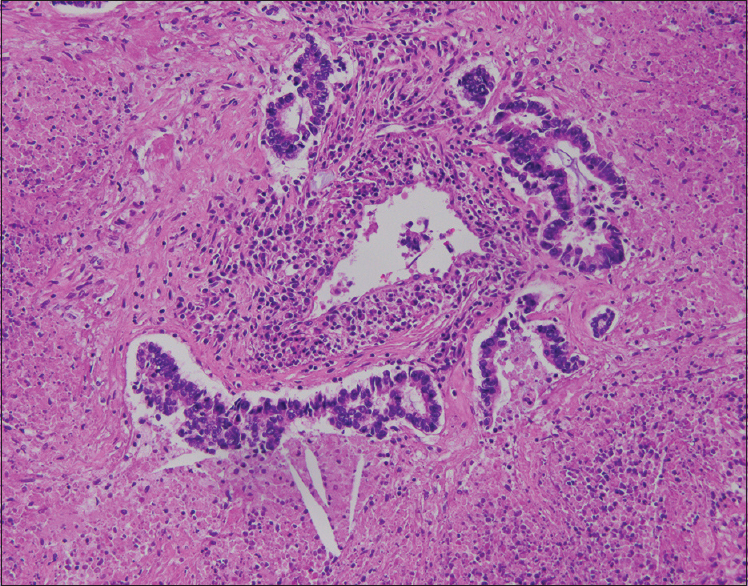 Fetal adenocarcinoma, a histologic variant of adenocarcinoma, is a rare primary pulmonary neoplasm which has tissue architecture and cell characteristics resembling the developing fetal lung at its pseudoglandular stage (8–16 weeks of gestation). They are subdivided into low (well-differentiated) and high-grade forms (with at least 50% of the fetal morphology). The low-grade form occurs in younger patients, shows slight female preference, constantly exhibits aberrant β-catenin nuclear/cytoplasmic expression and has better survival. Inversely, the high-grade form occurs in elderly men who are heavy smokers and is diagnosed at an advanced stage. The symptoms of fetal adenocarcinomas are non-specific. They are more commonly found at the peripheral field and seen as a solitary solid lesion by the CT scans. It is difficult to identify the lung mass as fetal adenocarcinoma by clinical manifestations and imaging studies alone. Microscopically, such tumors exhibit irregular tubular or adenoid structures lined by columnar epithelial cells with glycogen-rich clear cytoplasm and stratified nuclei. Morula formation with optically clear nuclei rich in biotin is observed in low-grade fetal adenocarcinomas. On the other hand, the high-grade forms lack morules, show more irregular glands with prominent nuclear atypia, more necrosis, and often coexist with conventional adenocarcinoma, large cell neuroendocrine carcinoma, or enteric adenocarcinoma. 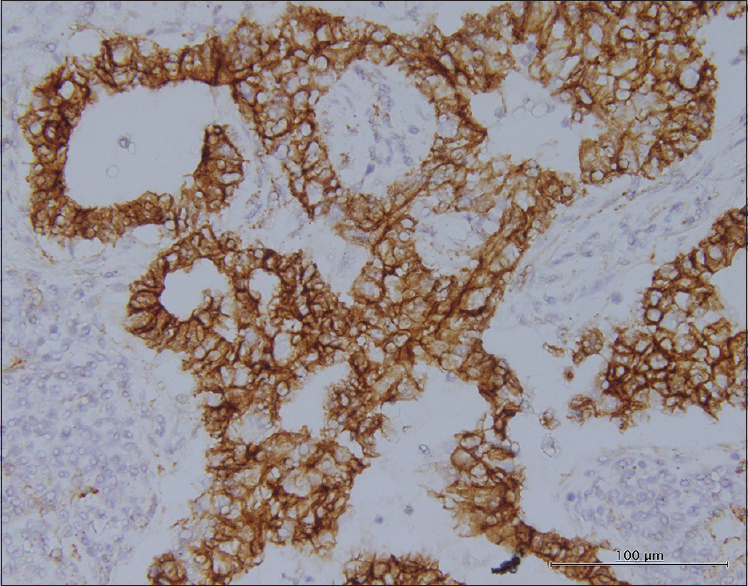 Immunohistochemically, the fetal-type component was commonly immunopositive for oncofetal markers, including α-fetoprotein, glypican-3, and SALL4, and neuroendocrine markers such as chromogranin A, synaptophysin, and CD56. The Wnt signaling component upregulation such as β-catenin has been known for low-grade fetal adenocarcinomas. Lower frequencies of major driver mutations of lung adenocarcinomas such as epidermal growth factor receptor and KRAS in high-grade fetal adenocarcinoma suggest that they may have distinctive molecular features. Regarding prognosis, the high-grade fetal adenocarcinomas are aggressive and recent study demonstrated that they had lower overall and disease-specific survival rates than other histological subtypes of adenocarcinoma except micropapillary predominant subtype. I would like to give sincere thanks to Dr. Yung-Hsiang Hsu, Department of Pathology, Buddhist Tzu Chi General Hospital and Tzu Chi University, for assisting to get the diagnosis, and Dr. Chia-Wen Shih, Department of Pathology, Lotung Poh-Ai Hospital, for performing β-catenin immunohistochemistry. The authors certify that the patient has obtained appropriate patient consent form. In the form, the patient has given the consent for her images and other clinical information to be reported in the journal. The patient understands that her name and initial will not be published and due efforts will be made to conceal their identity, but anonymity cannot be guaranteed. Zhang J, Sun J, Liang XL, Lu JL, Luo YF, Liang ZY, et al. Differences between low and high grade fetal adenocarcinoma of the lung: A clinicopathological and molecular study. J Thorac Dis 2017;9:2071-8. Suzuki M, Nakatani Y, Ito H, Narimatsu H, Yamada K, Yoshioka E, et al. 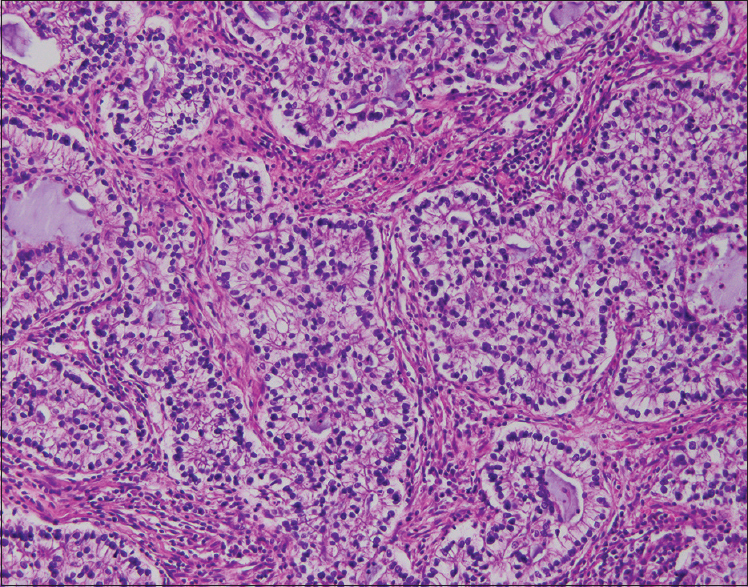 Pulmonary adenocarcinoma with high-grade fetal adenocarcinoma component has a poor prognosis, comparable to that of micropapillary adenocarcinoma. Mod Pathol 2018;31:1404-17.